The 'Black Panther' enemies are relationship goals IRL. Black Panther gave the world more than a much-needed movie dedicated to black excellence—it offered an amazing commentary on the black experience, action-packed scenes about securing the (fictional) world's most powerful metal, and Danai Gurira throwing her wig as a weapon. Oh, and it's also given us a possible budding romance between actors (and enemies in the movie!) 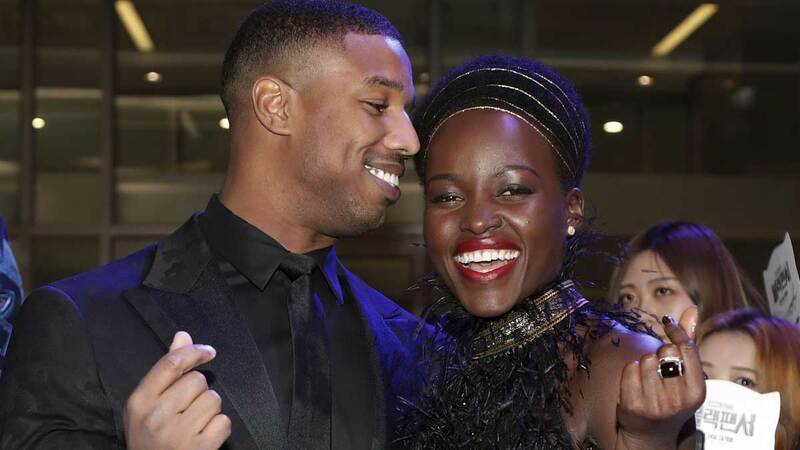 Lupita Nyong'o and Michael B. Jordan. The two have been spotted getting all sorts of cozy and comfortable (clock them in matching pajamas on their first-class flight, as you do), and sharing flirty pick-up lines on Twitter! One of them ended in Michael asking Lupita if she was ready for round two. Yes, girl, he did! Lupita's also making him do "on-call" push-ups thanks to an undisclosed bet that he has lost, but we've all won. Shall we? Here he is doing some calisthenics on the set of The View. And in a bunch of popcorn at the Calvin Klein runway show during New York Fashion Week. Here they are on a dinner date. Yeah, there are other people there too, but they’re sitting next to each other and Michael can’t stop panning the camera to her. Oh, to be a fly on that wall! 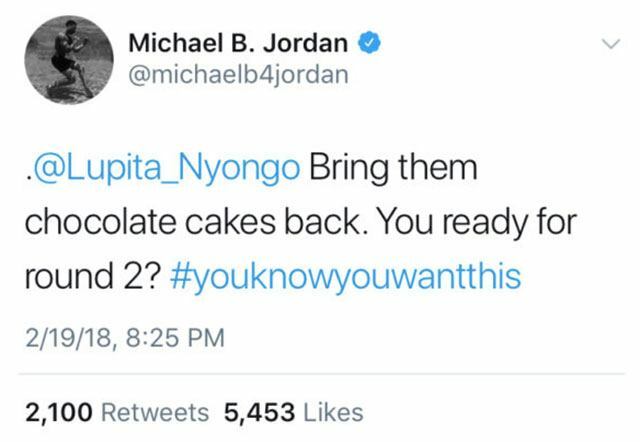 He also tweeted for her to "bring them chocolate cakes back." Okay! Go ahead, Michael! Sadly, this initial tweet was a dare and he deleted it, but does Lupita know that!? Who cares if it's a dare as long as it's true, right? Everyone else definitely approves of this relationship. If anyone were to take Michael from me, Lupita is a more-than-worthy opponent. Bless you, Lupita. She is truly down for the cause and giving us more Michael in Marvel-shape.